Upper Merion Area Community Cupboard – Community. Empathy. Food. WHAT AND WHERE IS THE UMACC? The Upper Merion Area Community Cupboard (UMACC) is a food pantry open to anyone who lives within the bounds of the Upper Merion Area School District and is hungry or food insufficient. The UMACC is a collaborative and empathetic community response of our schools, municipalities, businesses, communities of faith, and caring neighbors. Our hope and goal is to strengthen our most vulnerable neighbors through food supplementation. The UMACC is located in the Valley Forge Presbyterian building (191 Town Center Road, KOP). The parking lot entrance is off Independence Road. Using 227 Independence Road (19406) as a destination in your GPS/Maps App will get you closest to the entrance. The entrance to the UMACC is down the ramp off the corner of the parking lot. Look for the red wooden doors! WHEN IS THE UMACC OPEN? The Upper Merion Area Community Cupboard is open EVERY TUESDAY from 9:30 – 11:30 AM or 5:30 – 7:30 PM. Patrons are welcome to shop two times each month. Any hungry neighbor within the bounds of the district may come. Patrons do not need to demonstrate any identification or proof of income. If you are hungry and would like to learn more about the UMACC, or, if you are hungry and would benefit from a food delivery because you cannot physically make it to the UMACC during open hours, please contact us at Contact@UMACC.org. WHAT ITEMS DOES UMACC NEED? HOW CAN I DONATE FOOD TO UMACC? If you would like to arrange to have a donation either picked up or dropped off at the UMACC at another time, please email Contact@UMACC.org. We welcome the donation of healthy perishables such as fruits, vegetables, milk, etc., which can be dropped off at the UMACC on Tuesday mornings after 9am. ONE DISTRICT, ONE CAUSES RAISES MONEY FOR UMACC! 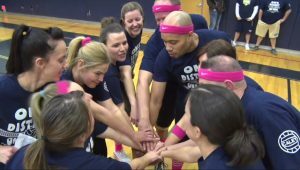 The One District, One Cause fundraiser was the first of its kind for Upper Merion, bringing together 16 staff teams from across the District to unite in the fight to raise money for the Upper Merion Area Community Cupboard. All seven schools in the district sent teams, in addition to teams from Central Administration and the School Board. Students from across the distric packed the stands and brought an electric, palpable energy as they cheered for their teams. Click here: https://bcove.video/2Hzs1Mo to see a video feature about the event!